OraVet helps prevent and control periodontal disease by creating a barrier that plaque is unable to attach to. OraVet is a waxy type sealant applied to the teeth during a dental cleaning. The sealant is placed on all exposed surfaces of the tooth. Following the professional cleaning, it is applied at home on a weekly basis. 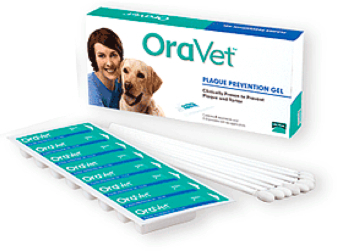 Because plaque turns into tartar or calculus, OraVet helps to prevent the formation of those byproducts. OraVet is just one key home care product that can help slow down periodontal disease. Please visit OraVet's website to learn more about the product.